I spent this week in Charlotte and wanted to test out Lime’s new Electric Scooters. Here’s what I discovered. I downloaded the app and funded my account. The first step to go for a ride is to get the Lime app on your phone. The app is available on both Android and iPhone devices. I pulled out my Samsung Galaxy S9 and downloaded the app while drinking a Mocha Latte at Smelly Cat Coffee House. I added my credit card information and purchased $10 worth of credit. No driver’s license is required. I have read that the app tells people to avoid riding on sidewalks and that a driver’s license is required; you most definitely do not need to provide your driver’s license to the app and if Lime tells you to stay off the sidewalks I never saw the screen. Next, I located my scooter. Once you have the app installed, you can see a Google map based on your location. Thankfully, there was a scooter located just a couple of blocks from me, because, well, it was 92 degrees out. I navigated to the scooter and the GPS coordinates were surprisingly accurate. There it was, sitting by stairs to someone’s apartment. Once you’ve located a scooter, you scan the QR code on it using the Lime app and the scooter makes a nice jingle letting you know it is ready to go. The instructions are simple: press the throttle to go. I pressed the thumb lever down and nothing happened. I looked at it perplexed and pressed the button harder, and it still wouldn’t move. Finally, I pressed the throttle hard enough to snap it off and nothing happened. I reported the scooter broken and moved on. I was charged anyways and lost 1 dollar. My second attempt was successful, but the scooter was hidden. The map was a bit confusing to me, although by now you’ve probably guessed that I’m easily confused. After walking a block in the wrong direction, I was finally on my way towards scooter #2. 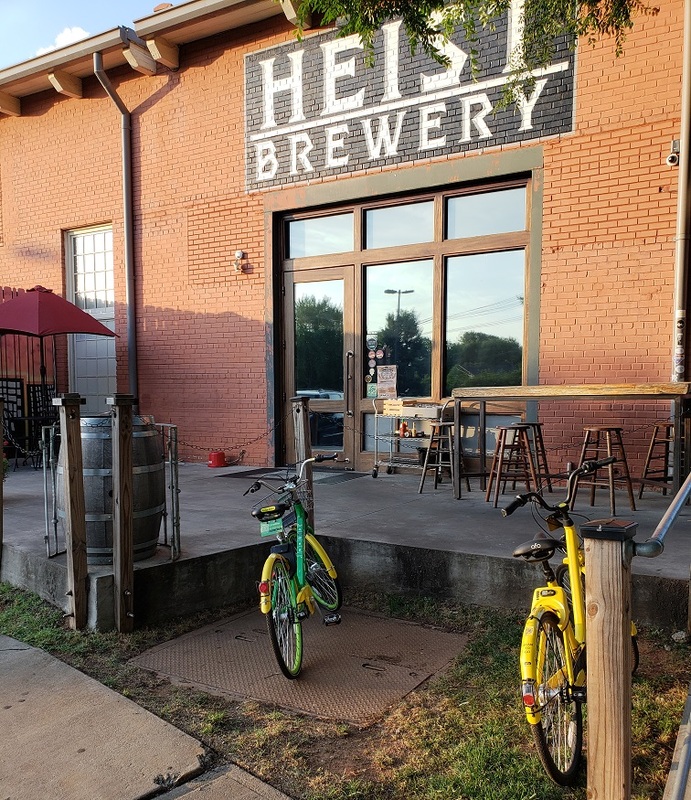 It turns out the next scooter was at Heist Brewing, which cranks out some delicious IPAs. I had already had a Hop Drop IPA from NoDa, so no more beer for me at the moment. I walked up to Heist and saw a Ofo bike and a Lime but no scooter. By now I figured out that some poor craft beer drinker was enjoying their beer and hoping that their ride was still available when they were finished drinking. I felt like I was stealing by the time I found the scooter. I walked around to the side of the building, and there it was, slightly hidden! I quickly unlocked the scooter and hit the throttle. Nothing! By now I figured out that the scooter must be rolling to start. I planted my right foot onto the scooter like I once did about 34 years ago and shoved off with my left foot. Once rolling, I hit the throttle. Zoom! The electric scooter sprang to life. I drove right by everyone at Heist Beer without making any eye contact. This thing was fast and nobody was going to catch me for jacking their scooter! Do I ride on the sidewalk or on the street? I zipped down North Davidson Street. There is a bike lane of sorts but cars are parked beside the curb. I am left with the option of driving pedestrians nuts or driving down the street at 12MPH while 35MPH cars fly up on me. I try out the street for a moment but am a bit afraid of being killed so I zip onto the sidewalk. I almost wipe on some gravel but I manage to survive. As I approach pedestrians I zip back out onto the street. I’m again terrified of being killed so I go back onto the sidewalk. As I zip down the sidewalk, a vehicle exiting a parking lot is startled to see me appear out of nowhere and they stomp on their brakes. I politely stop, but they wave me on. Off I go again. I stop at a couple of corners and people check out the scooter. Pedestrians do not hate the E-Scooters (yet). At the corner I ask half a dozen people if electric scooter riders are driving them nuts. My small survey concludes that 0% of people are bothered by the scooters. Nobody seems to care, but, there are other obstacles on the sidewalks anyways such as people jogging. You can drop it off anywhere! Once I was done cruising around, I parked back at the coffee shop, hopped off and clicked “end ride”. 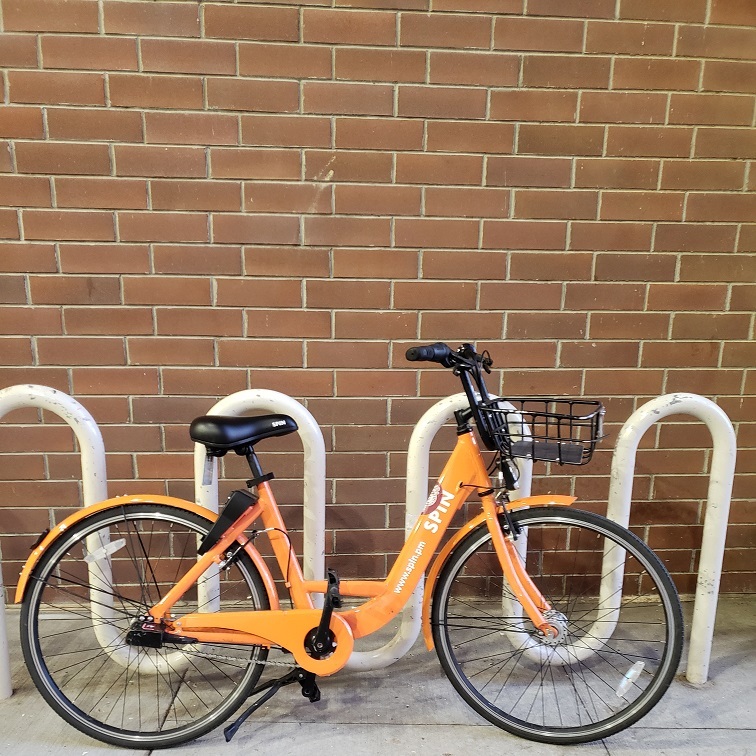 People in Charlotte are already accustomed to seeing green, yellow, silver and orange bikes parked in random places. There are a couple thousand of these bikes out and about. Some people do not mind them, other people think they look horrible. It’s all part of a pilot program which began in late 2017. Indeed, the bikes are everywhere. 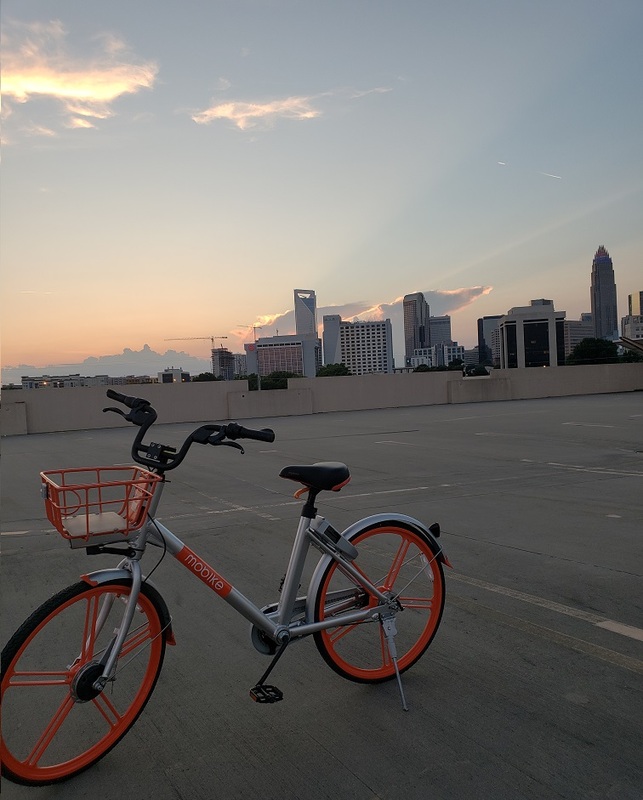 I even spotted a Mobike on the 5th floor of Target while checking out the great Charlotte skyline. As of June 15, 2018, the scooters lack regulation. Did Charlotte approve of these E-scooters? 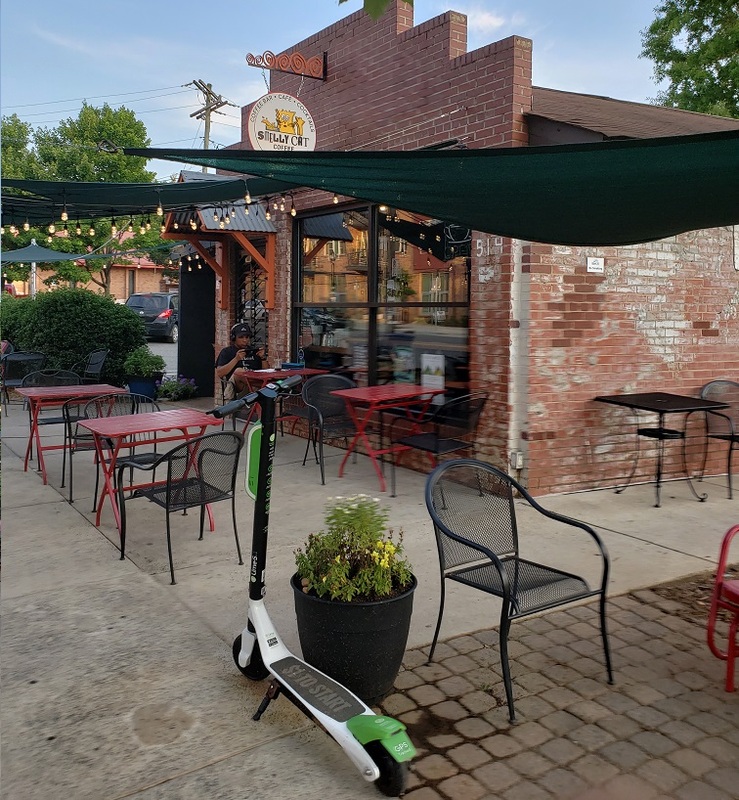 The scooters were launched, then quickly shut down by Charlotte, but now have approval. This all went down in May 2018. When are E-Bikes coming to Charlotte? I’m sure that this is right around the corner. E-Bikes are very cool as you don’t have to pedal up hill (or down hill!). In cities like San Francisco, there are classifications to electric bikes. Am I supposed to wear a helmet? Helmets are always a good idea. In North Carolina, kids under 16 are required by law to wear a helmet while cycling. 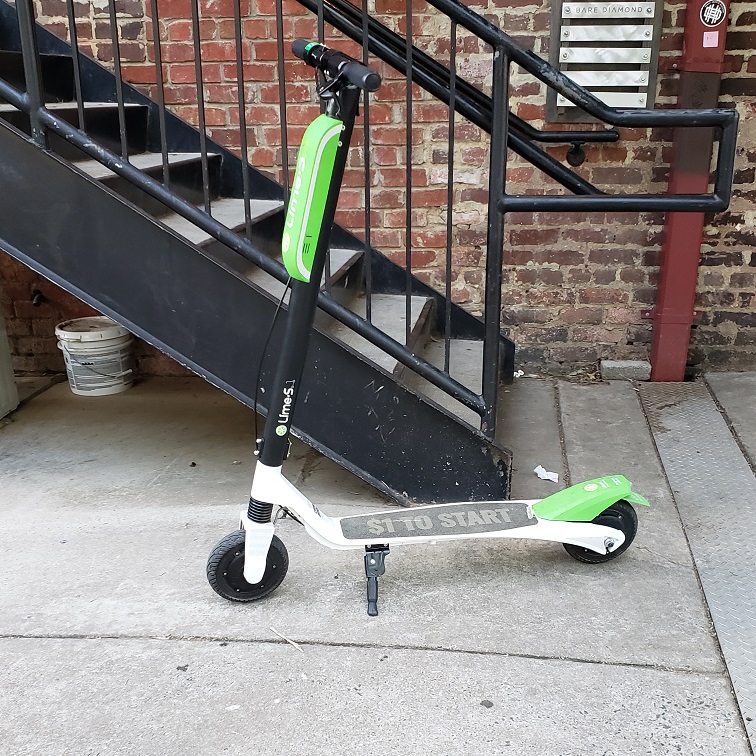 Bird has e-scooters in Charlotte. 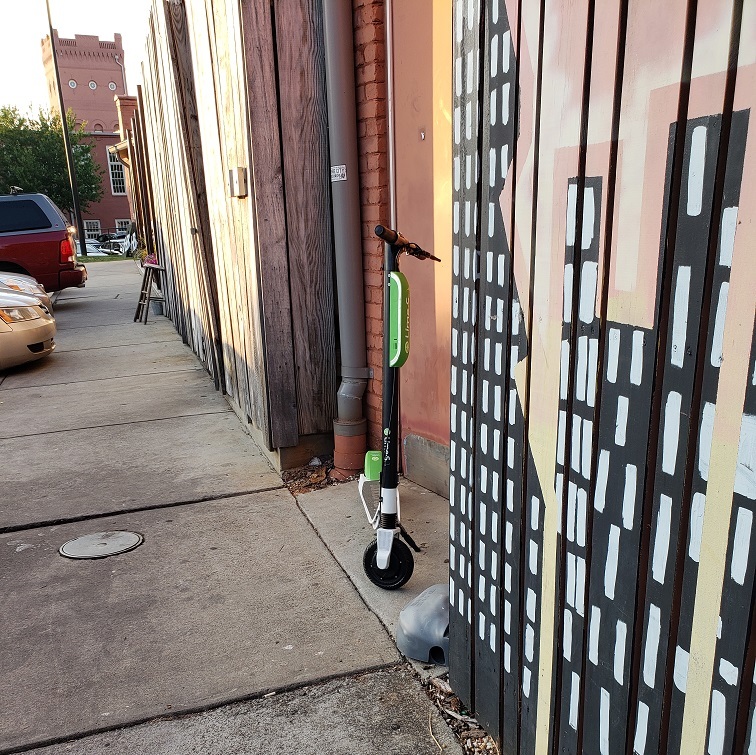 I did not see or drive a Bird scooter, but I was not in the area of Charlotte where Bird scooters are located.Expect Spin Scooters, too! Do you like the scooters? Have you ridden one? Are they an eyesore? Were you injured while riding an electric scooter?